Qui di seguito, estrapolate da alcuni siti web, potrete trovare alcune notizie essenziali che riguardano la nascita dell'attuale bandiera del Regno Unito. Si possono trovare altre valide informazioni on-line. Alla fine vengono proposte due schede che possono essere utilizzate nelle classi 4^ e 5^. 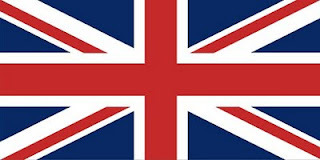 The formation of the Union Flag (Union Jack) came about as the result of the progressive merging of the inhabitants of the British Isles under one throne. 1603 - King James VI of Scotland inherited the English throne and became King James I of England. 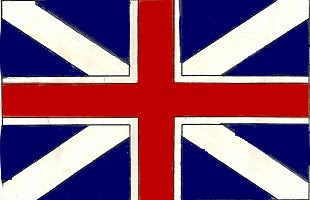 1606 - the National Flags of Scotland and England were united for use at sea (A problem arose, which flag should be hoisted on the king's ships. English sailors resented the Scottish colours and the Scots scorned the cross of St. George . 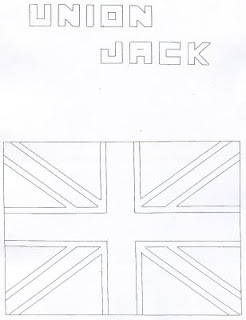 ), thus making the first Union Flag. 1707 - during the reign of Queen Anne, the first Union Flag was by royal proclamation made the National flag of Great Britain, for use ashore and afloat. 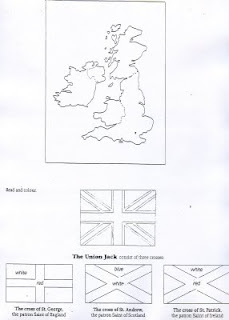 1801 - Ireland was united with Great Britain and the present Union Flag was formed. The Union Flag consists of the three heraldic crosses of St George, St Andrew and St Patrick. The flags of the Patron Saints of England, Scotland and Ireland are represented on the Union Flag. But, why is Wales not represented on the Union Flag? Because when the first Union Flag was created in 1606, Wales was already united with England from the 13th century. The broader (wider) diagonal white stripe should be at the top on the side of the flag nearest the flagpole. The UK flag is NOT entirely symmetrical! You can rotate the flag and it still will be the right way up but you can't invert it (not refective symmetry). 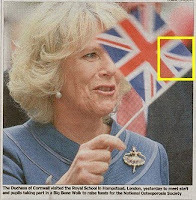 When is the Union Flag Flown? on the days of the State Opening and prorogation of Parliament. It is also flown on St David's Day (Wales), St George's Day (England), St Andrew's Day (Scotland), and St Patrick's Day (Northern Ireland).